We'd been invited to a high-school event on Tuesday this week. 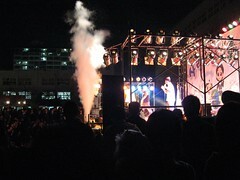 It seems that schools in Korea have a kind of open-evening once a year, where students provide demonstrations of their field of interest or expertise to other students and visitors. Although partly a recruiting tool for prospective entrants, it is meant to provide a chance to relax and even have some fun. So it was we found ourselves in a dark playground in front of a typically anonymous-looking Korean school building, watching a succession of high-school kids take to a stage in order to profess their desire to be singers or dancers before launching enthusiastically into their acts to the supporting screams of a few-hundred peers. There were a depressing number of 'Korean' rap numbers which despite my occasional rap indulgences just washed over me in their genericness, so the stand outs were a girl singing soul in English who possibly had the most amazing voice I've heard since Norah Jones, and a boy who implausibly sang what seemed to me like the kind number which Sinatra would have done - had he been Korean. They could both easily have been professionals though - and if I'd have been a music agent I'd have been signing up the girl for a record contract afterwards. Maybe this is what comes of the Koreans' fondness for locking themselves in singing rooms on an evening for hours at a time. It has to be said, one male power-ballad singer really didn't work out, and as he left the stage the professionally employed presenter said that it was possibly the worst act he'd ever seen. Near the back of the stage as I was, I expected to see the boy skulk away devastated but he appeared remarkably nonplussed by the critique. And presenter aside, that was a remarkable thing about the event. The crowd were supportive, no-one wanted anyone to fail, and when things got rough there would be attempts to join in with the words to drown out the imperfections booming out from the PA system. The teachers also performed a few acts - although I'm told this is more unusual. One would have thought that even if the students didn't invite public ridicule on themselves, the teachers might by breaking down the barrier between them, but it was all remarkably good humoured. Personally, I'm not sure I'd have wanted to turn up to school the next day after doing some of the things they did but I guess it's just not the same here, where teachers generally command much more respect than their British counterparts. While the stage-show was very professionally produced, we were a little surprised at the lack of other activities. This was a vocational high-school specialising in the hospitality industry, so their were a couple of stalls where students had cooked dishes and mixed cocktails, but otherwise that was it by the time we got there - it seems we'd missed more of the food and drink stalls though. Even so, apparently many other school events are much more extensive than this.